Here’s the full list of this year’s Academy Award nominees who are hoping to take home a little golden man tomorrow night, Sunday 25th February 2019. I’ve had a go at predicting the winners below, using my normal system of 1. for most likely winner, 2. for what’ll win if the first choice doesn’t, and I’ve indicated a P. for my personal preference of who I would like to see win where applicable. 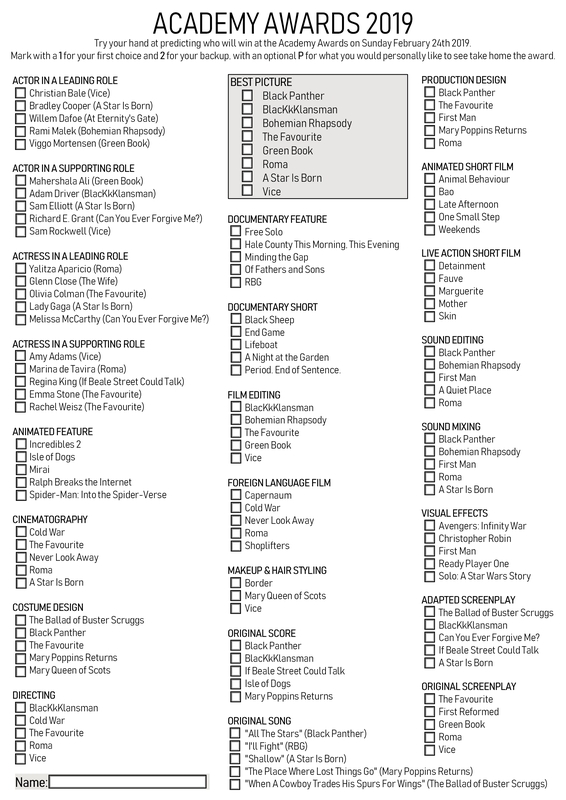 Also, you can download a full printable 2019 Oscar PDF ballot sheet here that can be completed digitally or printed and written on old school. Why not have a go at predicting the winners or challenge your friends and family to do the same. I’ll be watching the ceremony tomorrow night eagerly, though I don’t expect many big upsets or surprises, though I hope for some! 1. Period. End of Sentence. Oscar Nominee: Can You Ever Forgive Me?